Folks in Tremont are locking up and hiding their keys after a car theft. A man and teenage girl were held at gunpoint, then the thieves drove off with their car. TREMONT, Ohio — Folks in Tremont are locking up and hiding their keys after a car theft. A man and teenage girl were held at gunpoint, then the thieves drove off with their car. Police responded to the Tremont Barrio where they received a report of a carjacking that happened in the 2100 block of West 7th Street on Dec. 12. The victims got in their vehicle when a man ran towards the car pointing a handgun at them, police said. The man banged on the window, opened the door and grabbed the teenage victim's purse, demanding they give the man "everything they got," according to police. The teenage victim jumped out of the car and the man sat down in the passenger seat. Another man approached the driver side of the vehicle and robbed the driver, and then took his place in the vehicle, police said. The two men then fled the scene in the vehicle, according to police. 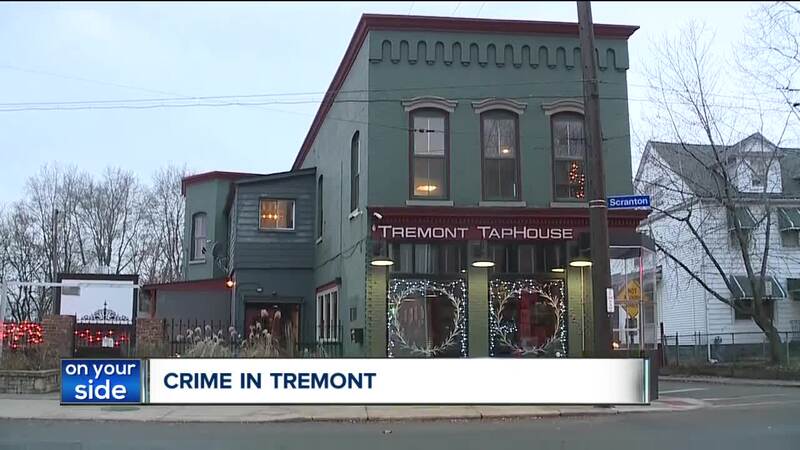 Tremont Taphouse partner Chris Lieb said they installed cameras around the entire building, overlooking the parking lot, front door and streets to keep customers safe. Lieb said car break-ins are nothing new to the area and come with the seasons. He said thieves target the area based on the season, and the holidays are always one for folks to watch out for. Plus, he said the area is highly accessible from multiple directions, making it easy for thieves to grab and go. “You can get on the freeway over here. You can get on the freeway over there. You can dump down and get on 490 back there. You can get in and get out," Lieb said. Sherry Skutnik said her car was broken into recently. Fortunately, she was okay, although the incident left her frightened. “I actually stepped back from the car, and it was one of those moments where I really missed my husband," Skutnik said. "It scared the jeepers out of me. As a reminder during last minute holiday shopping, keep your car clear of anything valuable, and always lock the doors.